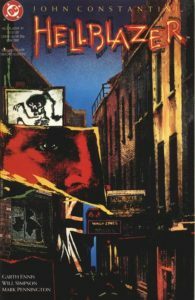 The John Constantine, Hellblazer comic books definitive issue-by-issue collecting guide and trade reading order for omnibus, hardcover, and trade paperback collections. Find every issue and appearance! Part of Crushing Krisis’s Crushing Comics. Last updated January 2017 with titles scheduled for release through July 2017. John Constantine is a profane and deeply self-interested magician and sometimes detective. He was invented by Alan Moore as a foil and sometimes guide for Swamp Thing in 1985 but went on to star in one of DC’s longest-running modern series written by a host of famous (typically British) comic authors. Join the Crushing On Crushing Krisis mailing list for a notice whenever this page is updated with new collections – plus, a not-more-than weekly ping about new comics content. 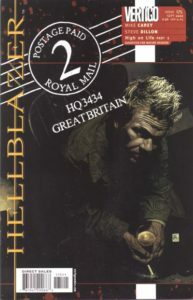 Hellblazer #39 and 100, Vertigo Secret Files: Hellblazer #1 (2000), Hellblazer #53, flashbacks in Hellblazer #13, Hellblazer/Books of Magic #1-2, flashbacks in Hellblazer #31, Sandman Presents: Love Street #1-3, flashbacks in Hellblazer Special #1 (1998): “Confessional” and Hellblazer #11, Shade, the Changing Man Vol. 2 #42-44, flashbacks in Hellblazer #130, and a backup in Hellblazer #75. A panel in Secret Origins (1986) #27 alludes to Zatanna’s training (and affair) with Constantine, as revealed in his Swamp Thing appearances. 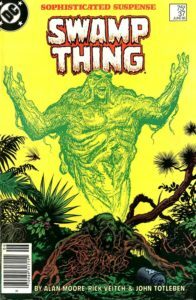 Switches titles to “Swamp Thing” for #39-41; this collection collects #35-42. Previously collected as Volume 3: The Curse paperback. Collects #43-50 and The Vertigo Gallery: Dreams and Nightmares (1995) #1 (Hellblazer appears in this issue, but not in the Swamp Thing story collected here) Previously collected as Volume 4: A Murder of Crows paperback. Collects #51-56. Previously collected as Volume 5: Earth to Earth paperback. Collects #57-64. Previously collected as Volume 6: Reunion paperback. 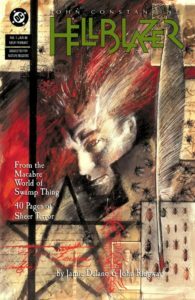 Writer Jamie Delano was tapped by Alan Moore to continue the character of Hellblazer from Moore’s run on Swamp Thing into his own title, which would go on to become an anchor of the Vertigo line (beginning with #63) and one of DC’s longest-running titles. In fact, it was the last three-digit numbered title to be relaunched during their New 52 era that began in 2011. 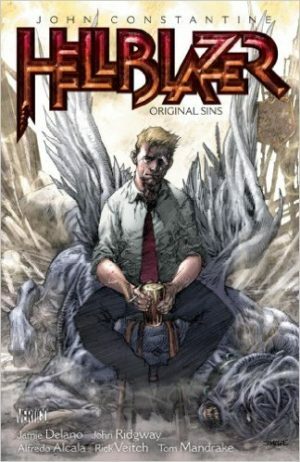 Over the years Hellblazer has been recollected into a consistent format twice – once in an aborted TPB line that began in 1997, and then again in a quickly-released line of TPBs that quickly blew threw dozens of previously uncollected issues. Also, TPBs cover every issue from #146 forward, whether they were initially or retroactively release. Also collected The Horrorist (1995) #1-2. 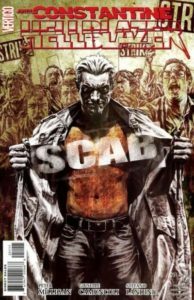 In 2011, a line of new TPBs launched is quickly blew past the prior four volumes while adding some new material, and continued running through the series in a dozen issues at a time – including some runs that were spottily collected. #189-300: Not yet announced in this format. Jump to this point in Hellblazer’s chronology. Jamie Delano writes from #1-40, with John Ridgway on art from #1-9. #9-10: Not collected aside from in the TPB series, above. Secret Origins Special: Hellblazer has a single-panel cameo in this 1989 special as a man-on-the-street interview on a TV show as written by Neil Gaiman. Given his niche appeal at this point, this is a bit of a joke for the in-the-know crowd. Delano continues to write with Richard Piers Rayner on art from #10-16. #12-18: Not collected aside from in the TPB series, above. Delano writes with Mark Buckingham (of Fables fame) from #18-22. #18-24: Not collected aside from in the TPB series, above. #29-30: Not collected aside from in the TPB series, above. After a handful of shorter run artists, Sean Phillips pencils his first issue of Hellblazer with #31 with Delano scripting. He would make many returns, penciling #31, 34-36, 51, 84-93, 95-100, 102-107, 109-114, 116-120, and 250. #31-34: Not collected aside from in the TPB series, above. #36-40: Not collected aside from in the TPB series, above. Garth Ennis writes from #41 to 83 (and, later, #129-133). He’s joined at #41 by penciller William Simpson for #41-47, 50, 52-55, 60-61, and 75 and by frequent collaborator Steve Dillon with #49, and later on 57-58, 62-76, 78-81. Then, Dillon later returns for #157, 175, and 200. 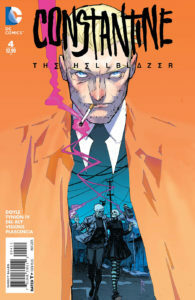 Hellblazer #51 can be read prior to #41. #51: Not collected aside from in the TPB series, above. The Horrorist (1995) #1-2: Though released a year later, this story fits here (but is collected along with issues #10-13). Sean Phillips returns to art #84 and pencils through #120 with a handful of breaks – #84-93, 95-100, 102-107, 109-114, 116-120, and 250. Eddie Campbell writes Phillips first arc, from #85-88. Warren Pleece pencils the end of Paul Jenkin’s run as author, from #121-128. Garth Ennis returns to write #129-133 with John B. Higgins on pencils. Higgins continues penciling, running from #129-139. 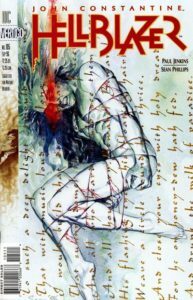 Superstar comics author Warren Ellis writes Hellblazer for the first (and only) time from #134-143. A complication that collects the Warren Ellis story originally slated to be Hellblazer (1988) #141, though it was shelved int he wake of the Columbine shootings. 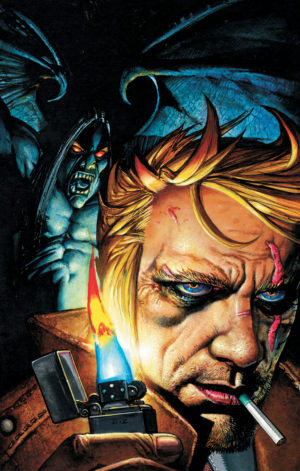 It is collected in John Constantine, Hellblazer: Volume 13: Haunted in proper story order. #144-145: Not collected except in new edition TPBs, above. These are the last issues that were not re-collected in a story-arc based collection- everything from this point forward has been collected at least one time. Brian Azzarello writes a lengthy run from #146-174 (and later returns for #250). He is joined by penciller Richard Vance Corben AKA “Gore” for #146-150. After pencilling the one-shot #143 in Warren Ellis’s run, artist Marcelo Frusin pencils from #151 through the end of Azzarello’s run and beyond – #151-156, 158-161, 164-167, 170-174 ,177-180, 184-186, 190-193, and 197-200. Artist Giuseppe Camuncoli fills in for Frusin on #168-169 and later returns for #206 before a length run from #234 through the end of the book. A cross-company tribute book; contains a Mike Carey Constantine story that fits after #167. Mikey Carey (also of X-Men Legacy and Unwritten) writes from #175-215 and 229. Set in the past, this is a story of Hellblazer’s ancestor seen in Sandman #13 and 29. The ongoing line of “John Constantine: Hellblazer” reprint TPBs are currently solicited through this point. Artist Leonardo Manco would fill-in for Frusin on #194-195 before taking over with #200 as one of the last pencillers with a run on the title. He drew #200-205, 207-212, 214-222, 224-228, 230-237, 239-242, and 247-249. Not certain about this placement. This graphic novel is by the period’s regular creative team – Carey and Manco! Constantine only appears in #3-5. Though released here, this may fit better read around #188. Denise Mina writes from #216-228, with Manco on art (also with Camuncoli, as noted below). Andy Diggle writes from #230-249, with Manco primarily on art. Artist Giuseppe Camuncoli returns on #243-244 and then pencils through the end of the book (with inks and assists from Stefano Landini) in #250-253, 256-258, 261-264, 267-275, 277-279, 281, 283, 285-290, and 293-300. Peter Milligan writes from #250 through the end of series with #300, primarily with Giuseppe Camuncoli. Eisner Award-winning penciller Simon Bisley joins the art rotation as Camuncoli’s alternate, drawing #259-260, 265-266, 271-276, 282, and 292. 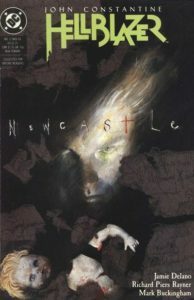 Bisley also contributes covers through the remainder of the run. A full-length, black and white, Constantine graphic novel from writer Ian Rankin and artist Werther Dell’edera. This fits best either prior to #250 or prior to #260. 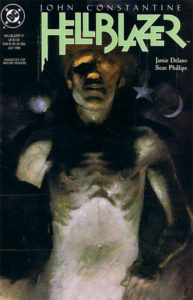 A 128-page story by original Hellblazer author Jamie Delano with artist Jock. May fit best in reading order prior to Dark Entries and Scab. Unsure of the story continuity placement of this one. Given that it involves Constantine being run over, it would need to fit into a gap in his story! 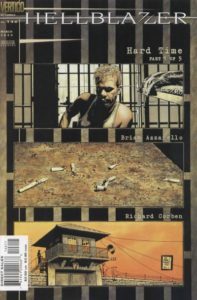 Though released here, this complication issue collects the Warren Ellis story originally slated to be Hellblazer (1988) #141, though it was shelved int he wake of the Columbine shootings. 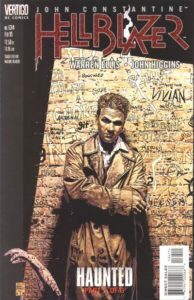 It is collected in John Constantine, Hellblazer: Volume 13: Haunted in proper story order. The similarly-named Vertigo Resurrected: Hellblazer (2011) #1 collects #57-58 and 245-246, as noted above. Vertigo Resurrected: Winter’s Edge (2011) collects Vertigo: Winter’s Edge (1998) #1-3, all of which collected Constantine stories, which are also collected in Haunted! 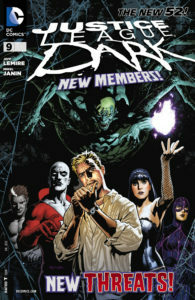 While his own long-running series was still had 18 issues left in its life, John Constantine began his first serious run in the DC Universe proper (you know, the one with capes) since Swamp Thing by anchoring the new title Justice League Dark for two years before his own series was relaunched as Constantine – a name by which he’d become more commonly known across media (and, indeed, in JLD). Issue #1 is also collected in DC Comics: The New 52 Omnibus. Collects #1-6. 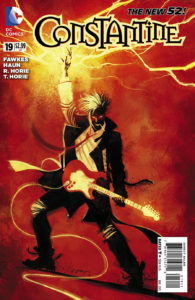 Constantine is a featured character in #4 and most of the issue is told from his perspective. It could conceivably fit prior to JLD #6. 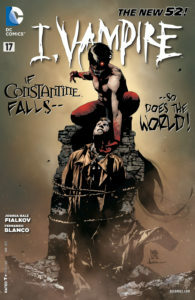 Constantine does not appear in I Vampire #6, though he is listed there in some guides. Collects #7-11, 0, & Annual 1. Constantine appears in a single-panel cameo in a dream in #7, then makes a proper appearance with Zatanna and Madame Xanadu in the final reveal of #9 and in #10. Constantine appears in the single-page tag of #0 to collect the artifact that seals Amethyst’s world, Nilaa, which means it occurs prior to JLD Annual 1 and #14. Issue #4 is a team-up with Princess Amaya. Issue #6 finds Constantine back in the House of Mystery and he unleashes Eclipso on Nilaa! This includes some amusing Constantine action, but nothing of long-term importance to him. He is mentioned in #7 but does not appear. Collects #12-19 and Swamp Thing #12 & 17. Constantine plays a brief-but-pivotal role in these issues. They do not especially have impact on Constantine’s continuing story. Collects #13-19 & 0. Constantine and the House of Mystery are central to this series’ grand finale. If you read the prior JLD/IV crossover, you should also read this. Collects #6-11. He gets in some good jabs with Nightmare Nurse in #9. #5-6 tie in to Trinity War. These issues straddle Constantine Volume 1 and 2, which will be made clear below. Collects #19-23 & 23.1. Issues #22-23 are a Swamp Thing and Constantine story that harkens back to his original Swamp Thing appearances. Issues #7-8 note that they occur during Trinity War. 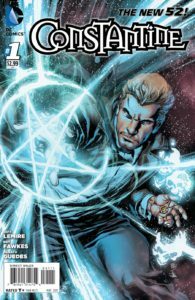 Issues #9-12 are part of the Blight direct crossover, in which Constantine appears in every issue except for Phantom Stranger #17. He also appears in The New 52: Futures End FCBD Special Edition (2014) #0, which is not collected here. Also collects Justice League Dark: Futures End (2014) #1, which appears in the Futures End omnibus. Collects Annual 2 and #35-40. The one-shot that kicked off the Rebirth era was already a perfect-bound, book-style issue. Here, it is upgraded to an oversize hardcover. Check Amazon for DC’s newest Hellblazer titles.